My fiancé – who hates courgettes – adores this soup. It’s simple and delicious – a favourite of ours in winter. 1. In a soup pot, fry the onions in a little salt (this stops them from browning) and garlic. 2. When the onions are translucent, add the sliced courgettes and grated potato. Stir lots to prevent the potato from catching on the bottom of the pot. 3. Add the rosemary and sage and crumble the chicken stock cube into the mix too. 4. Throw in the water and mix thoroughly after adding the packet of chicken noodle soup. 5. 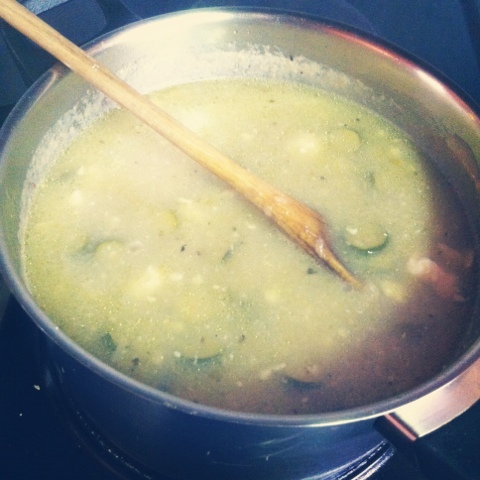 Cook on a low heat for 1-1.5 hours until the courgettes are mushy and the potato has thickened the soup. 6. Crumble the feta into the soup and let it cook until the feta has melted. 7. Use a masher/hand blender to smooth out the lumps/smoosh the last remaining courgettes. 8. Garnish with chopped spring onion and serve. So what do you think – easy or what? Let me know if you try it! This entry was posted in life things, love things and tagged cooking, food things, heart, life in south africa, love, recipes, yummy in my tummy. Bookmark the permalink.